Ariake is a furniture brand founded by Legnatec and Hirata Chair Manufacture Co. Ariake is named after the Ariake Sea in Southern Japan. Ariake means daybreak in Japanese and symbolizes a new chapter. The two factories, Legnatec and Hirata Chair has started a collaboration that will expand globally with its international designers. Ariake is a beautiful combination of japanase and scandinavian aesthetics. It is Ariake's philosophy that furniture is made for social situations where people live, work and eat together. 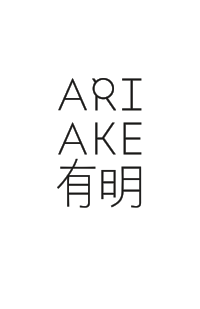 The Ariake brand was created during two intensive workshops in Morodomi where furniture designers, art directors, craftmen and photographers lived, worked and ate together to shape and generate a collective energy and mutual trust that would define the soul of the brand. The products made by Ariake is inspired by the spirituality of Japanese culture and urban living contexts which is seen in the combination of handmade- and machine-created products.